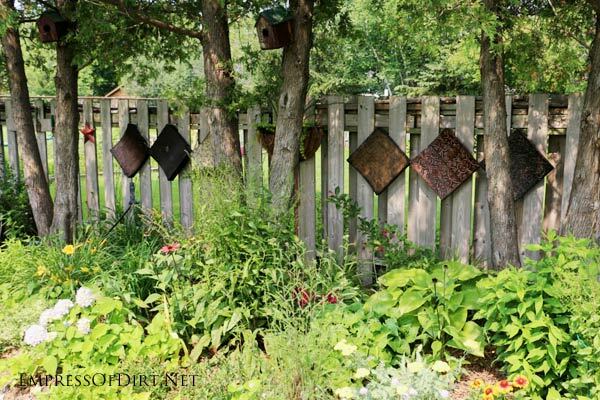 Fences and walls in a garden are just like the walls in your house, providing an opportunity to display art, show off your personality, and cover up peep holes. 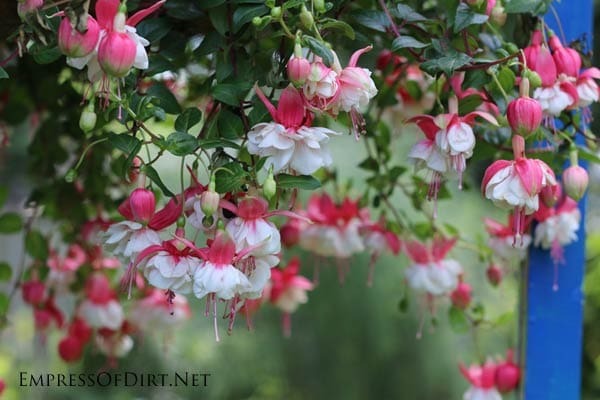 These ideas come from my own garden and gardens I have visited. 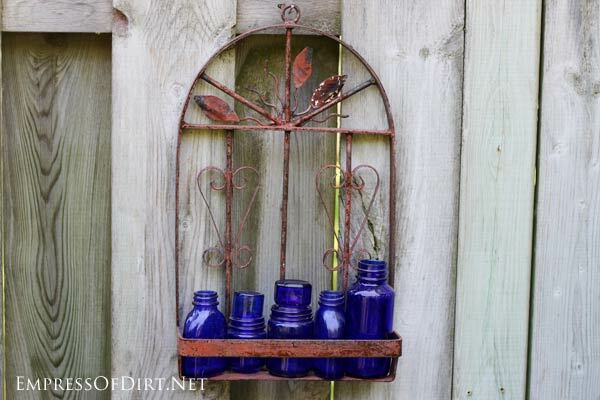 Some items can be made from repurposed items, and others are store-bought garden decor. Either way, I’m sure you will find ideas to adapt for your own space. 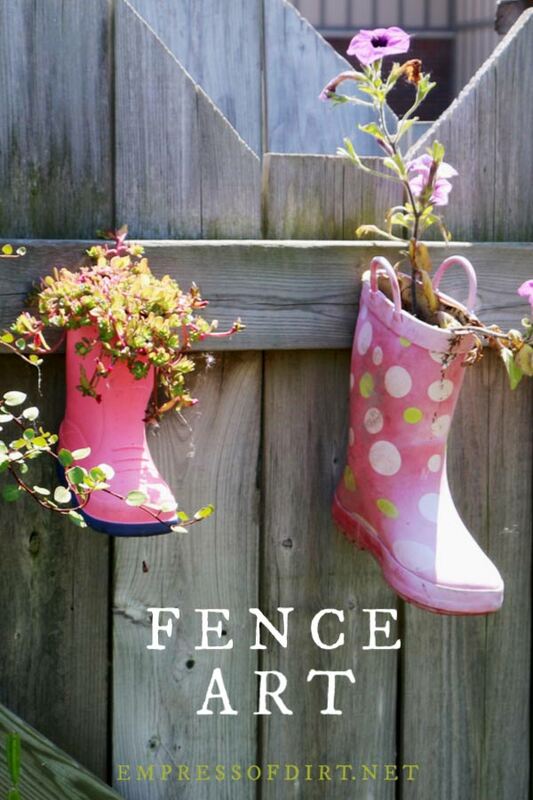 For more ideas, see the Garden Shed Gallery. This first one is from my garden. It’s not intentional, but I seem to acquire a lot of blue glass and dishes. If they are not of any real value or needed in the house, and can stand up to the weather, items like this add a nice blast of bold colour in the garden. Here’s another collection: random boots. You can see here that they actually had pairs but they split them up to make it more interesting. 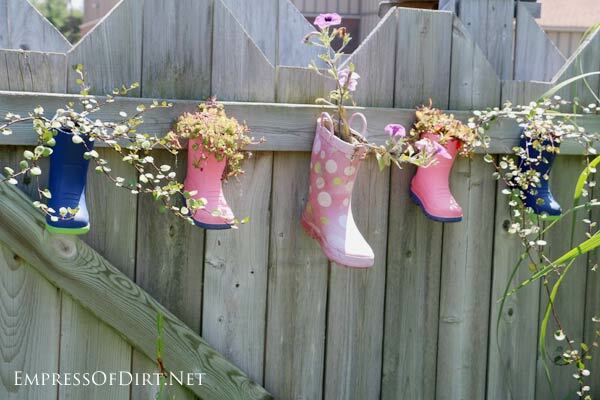 This seems like a good idea for all of the outgrown kiddie boots that are too far gone for donating to the thrift shop but can still hold soil and plants. And, when your child or granchild comes home from school without the second boot in their backpack, you can give a high five him/her and say, Thank you for the new flower planter. Because there are upsides to being forgetful. Not that I can remember them. Every time I mention mirrors in the garden, I will receive warnings about the possible hazards. And yes, you do have to plan the location carefully so it’s not in direct sun or a bird flight path. You can read more safety tips here for mirrors in the garden. 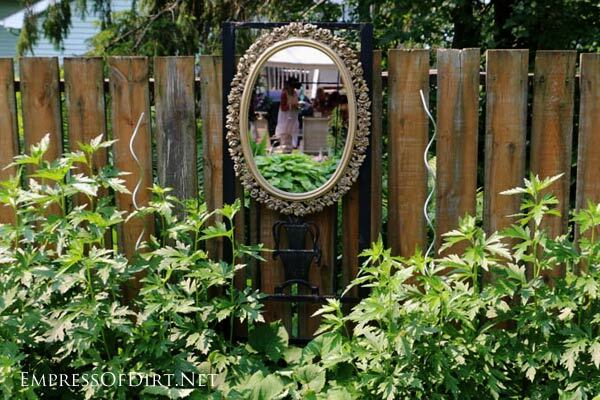 That said, the right mirror, in the right setting, can become a fabulous focal point in the garden. This style of optical illusion mirror was the inspiration for the one I made a few years ago. You can see the project with a tutorial here. If you don’t want to make one, this search in Amazon brings up some interesting options. 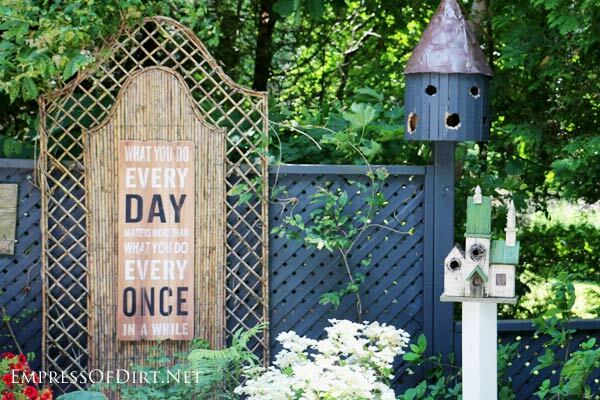 I realize this one usually divides people into two opposing camps for garden art (yay and heck no), but, those of you who love it, keep reading. 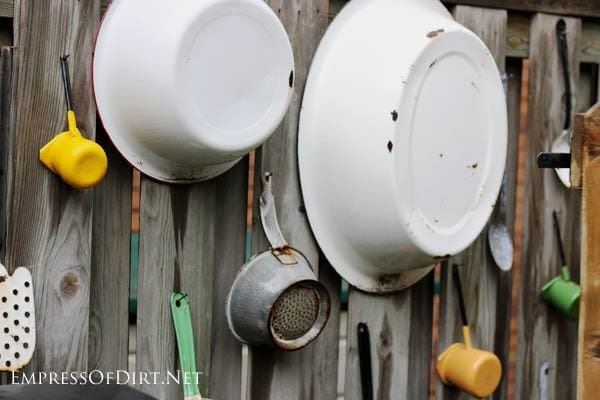 Many old enamel pots and pans are no longer useful indoors, but can make interesting fence art. Do you recognize those colourful little pots with the long handles? I think they were fondue pots for melting cheese, if I’m remembering right. Such groovy times. If you were around for the country decor craze of the late 1980s, you probably remember a lot of ducks and cows on border prints and dishes and sweatshirts and…everything else, hair scrunchies, ruffled curtains, hunter green accents, and… painted saws! 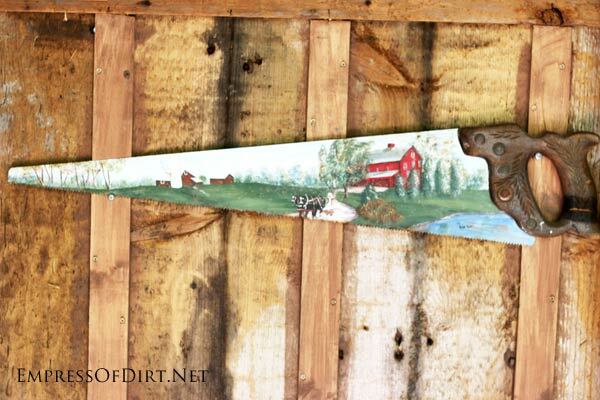 A few years ago on a garden tour I noticed painted saws on several sheds and, after shedding the 80s overwhelm, I have to say I still find them quite enchanting. I think it’s because I love miniature paintings in general and these tend to have finely done folk-art details. There are all sorts of them on Etsy, ranging from, um, kind of dreadful to quite delightful, in case you’re interested. Old circular saw blades seem to be popular again too now. You can see all the selections here. 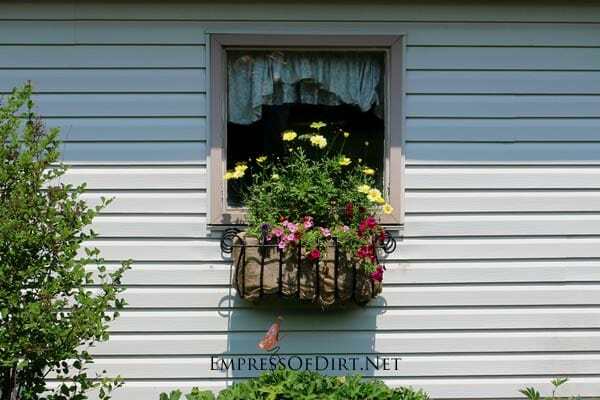 If you have a window on a shed or wall, a window box is an obvious choice to spruce things up. This one is metal with a burlap or hessian liner. The lace curtain is a lovely touch too. 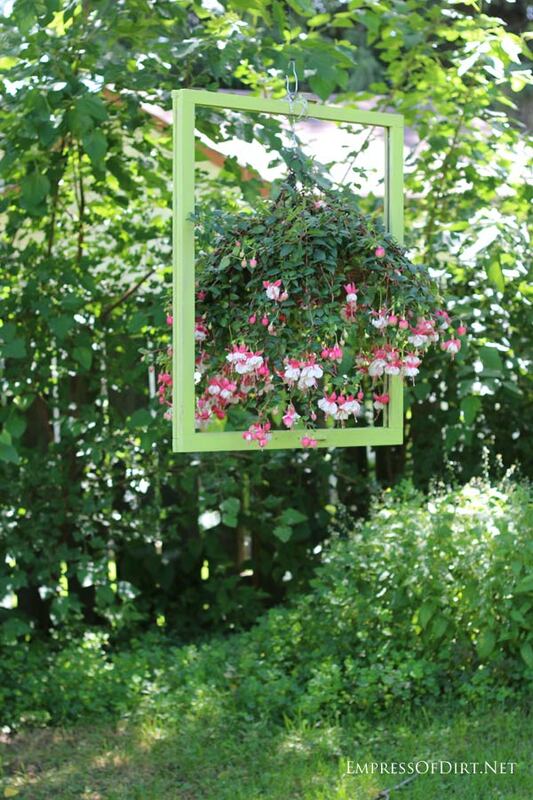 If you don’t have a window, use an old window frame (with or without glass) or an outdoor mirror with a frame. I love the artwork on old seed packets. You can see examples here on my Pinterest board. I’m always hoping a present day seed company will switch to art like that. I have seen all sorts of variations of this including reproductions on metal sheets (like the ones below), as well as copies blown up and attached to wood using Outdoor Mod Podge. There are lots of decor items and posters with vintage seed packet art here on Amazon as well. If you make your own, be sure you’re choosing art that is copyright-free or permitted for copying via a creative commons agreement. This sitting area is in one of my top favourite gardens, from a local garden tour. The whole place was packed with fabulous plants and art, all playing off each other. 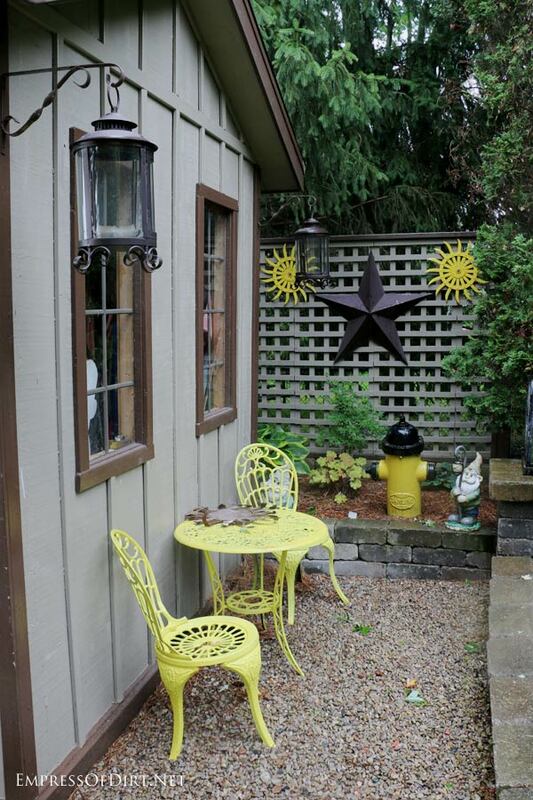 I’m sure it’s no coincidence that the yellow theme is carried through the decor and furnishings in the photo below. 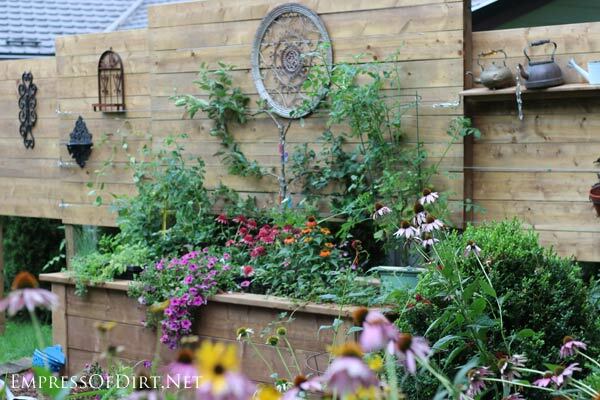 This gardener has a great sense for making every plant stand out and having colors play off each other. Pick a bold colour, and use it throughout your space. In moderation, of course. I love stuff like this. 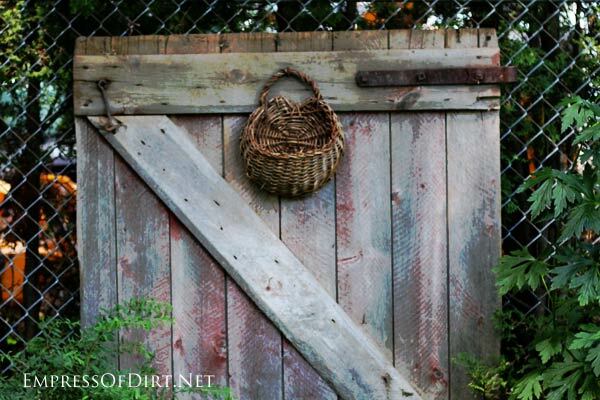 The old gate is a work of art in itself. I would be tempted to have it inside my home. 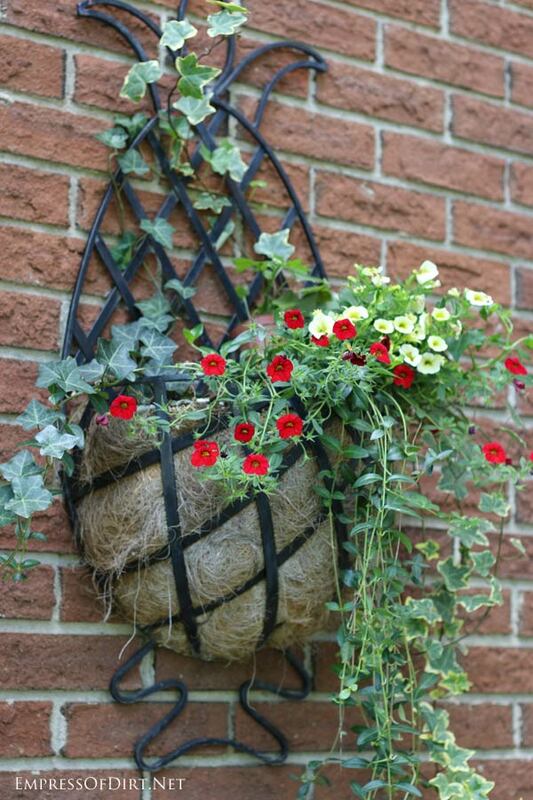 And the wall basket adds a simple, rustic touch. I think the whole thing is particularly effective in contrast to the chain-linked fence. 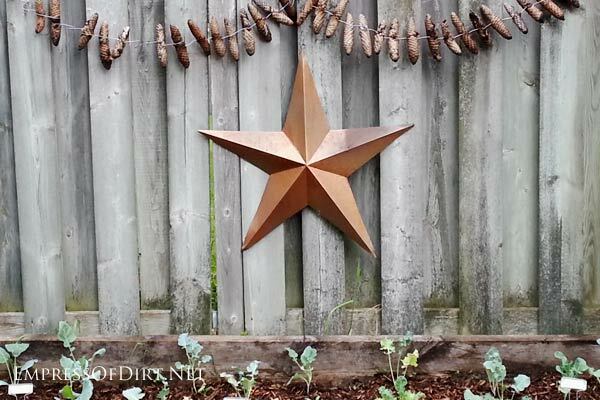 If you are looking for ways to disguise or cover-up chain-link fence, this post has a whole bunch of ideas including some really nice ways to upgrade without the expense. It doesn’t have to fit! I love how this oversize sign stands out against the privacy fence. If you look closely, I think they took a regular-size sign and mounted it on the willow divider frame. Good idea. 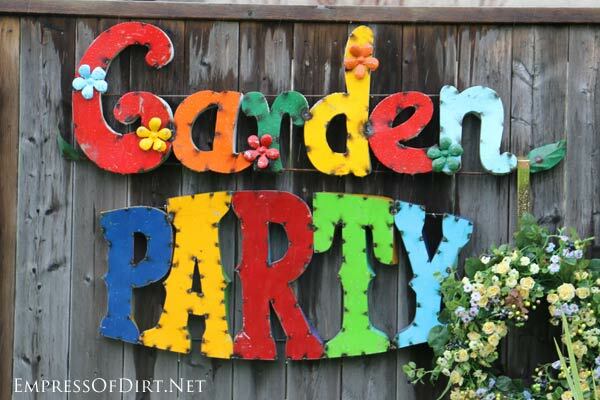 If you’re on the lookout for a fun garden sign, there are tons of good selections on Etsy. Plus, some vendors will take custom orders. 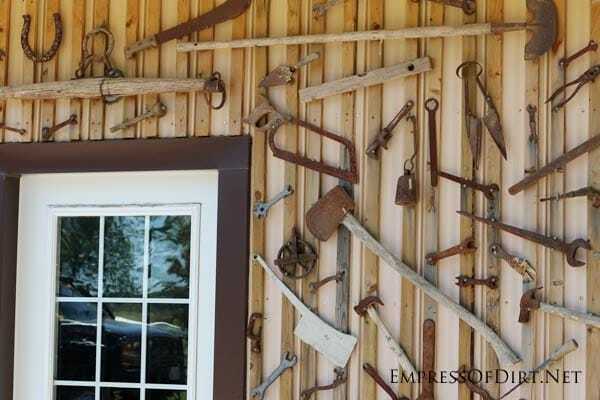 This shed had the most incredible collection of old tools. So many, in fact, that I feared they had used up all the old tools on planet Earth. You can see more photos of it here. Seriously, there are a lot of them. 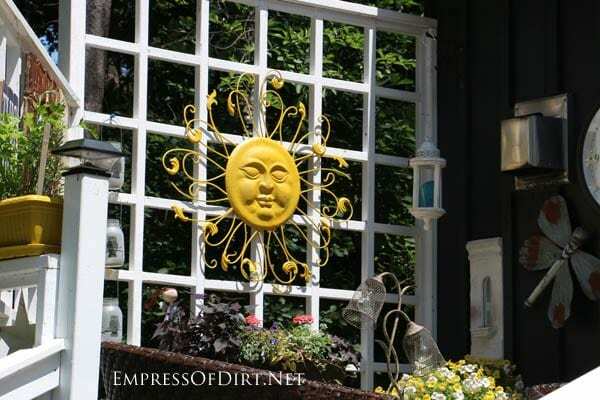 I really love the placement of this metal sun face. It’s quite perfect on the patio trellis. There are lots of variations of the sun faces here on Amazon and more here on Etsy. This is from my garden. I found the star in the garbage. And I started the pinecone garland one year for fun. This is also from my garden. I built the raised bed and privacy fence to add good growing space and block out all the pedestrian traffic from the house next door. 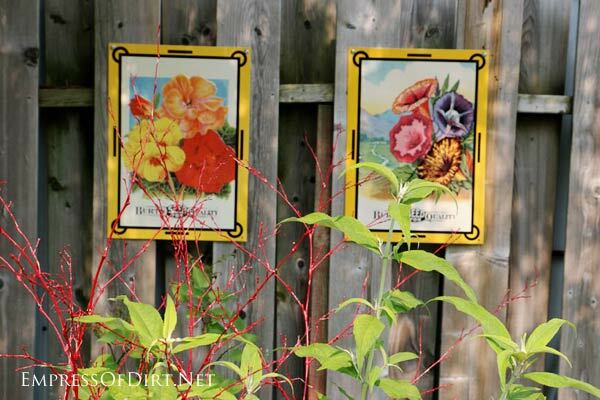 The wall offers lots of room to display garden art. If you click through to the post here, you can see more. Repetition is key in decor. 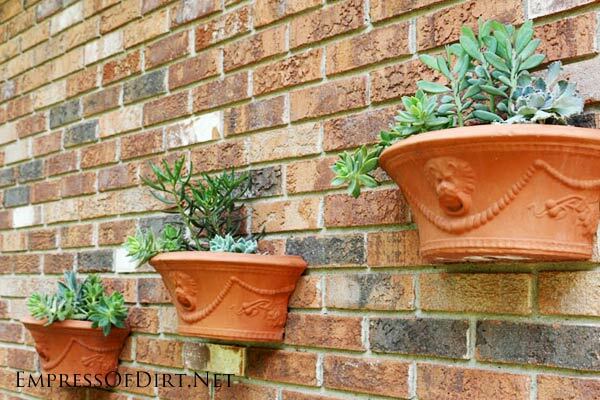 Here, some the wall-mounted planters unify the look. And the nice selection of succulents tops it off. The whole thing looks good on the brick wall, don’t you think? I’ll assume you agreed. 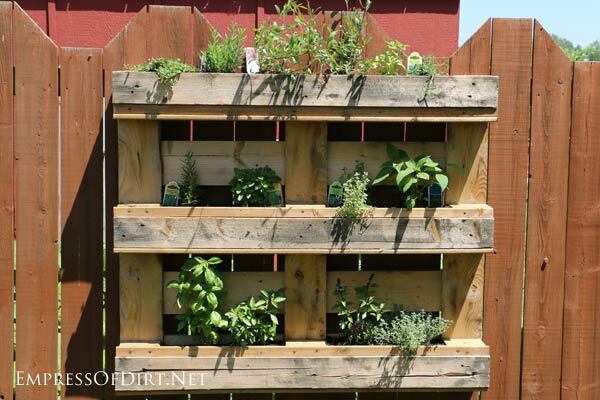 Here an old wood pallet is transformed into a herb planter. You could keep it plain or paint the raw wood. Here the herbs are in their own containers. If you want to plant directly in the pallet, be sure to check the code on the wood to know if it has been treated or not. There’s some nasty chemicals in some of these pallets. 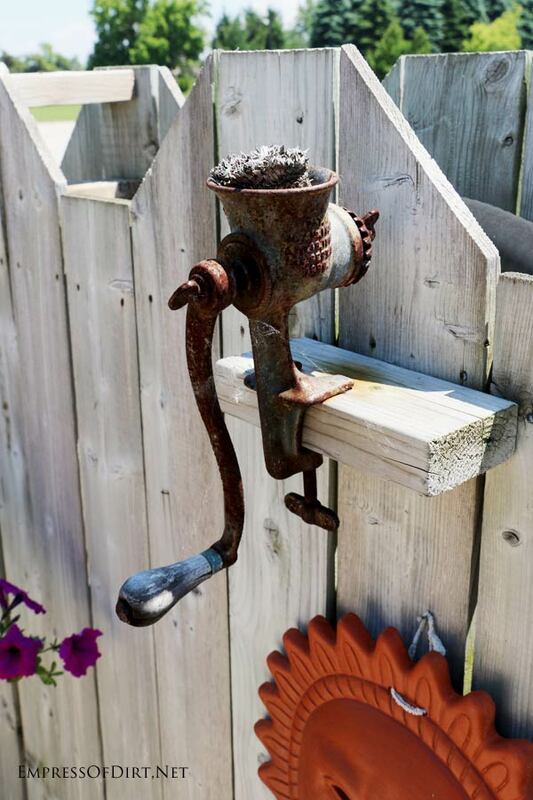 A meat grinder succulent planter. Need I say more? And no succulents were harmed in the making of this art. These ones are in my garden. I didn’t really have a plan. 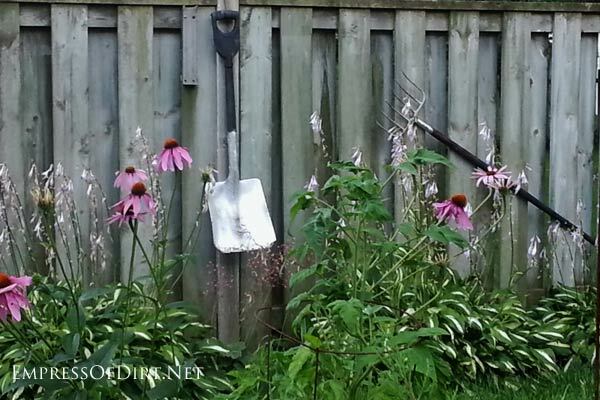 I was just sorting garden tools into the useful and useless piles and the useless ones ended up on the fence. And there they hang: beautiful and useless. Which of course now makes them useful once again. Hold your horses. I have a point to make. 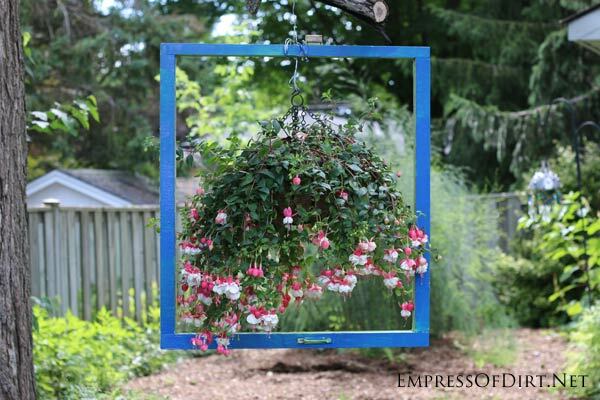 I had this old window frame in my shed and I hung it from a tree branch with a pot of fuchsias. It’s painted blue on one side and green on the other. It looks totally cool when the wind slowly twirls it around. 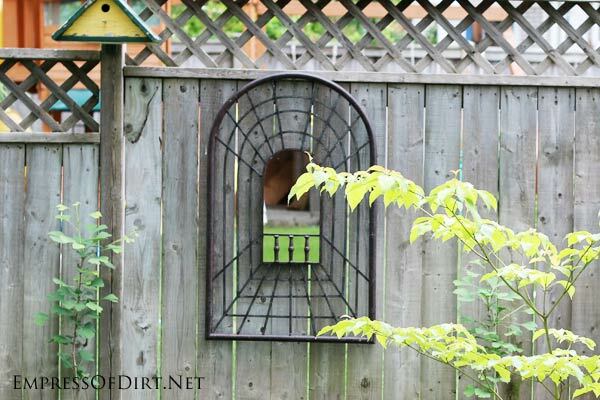 So, my point is, this frame creates a sort of wall in the garden, dividing two areas. So, if you don’t have a wall or fence, try hanging your art from a tree like I did. And if you don’t have a tree, ask a friend to hold the whole thing for you. That’s a sign of true friendship, I believe. And here is a gratuitous photo of the flowers. So pretty. We live between two great lakes so that’s probably why I see so much nautical-themed art on garden tours. Mermaids are very popular right now, especially those mermaid blankets with fins and mermaid swim suits (funny!). 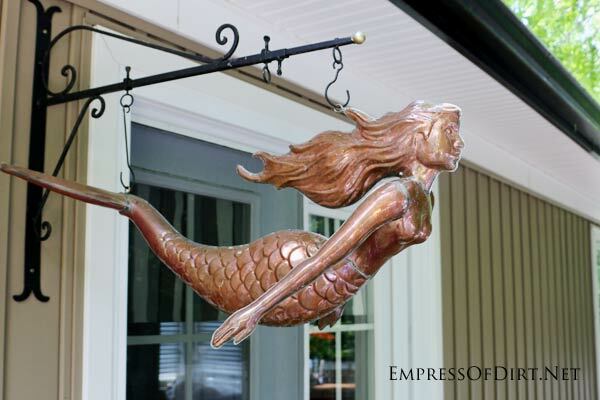 I love this copper mermaid. I have no idea if it’s old but I’m guessing so. You can see mermaid garden art here on Amazon. Or get yourself a fin blanket. I had this photo in my archives and I cannot find the large resolution version to determine what these are. They kind of look like carpet samples but I really can’t recall. That said, the point is anything goes. For me, if an item can stand up to the weather or weather artistically (like copper does), it’s suitable for garden art. 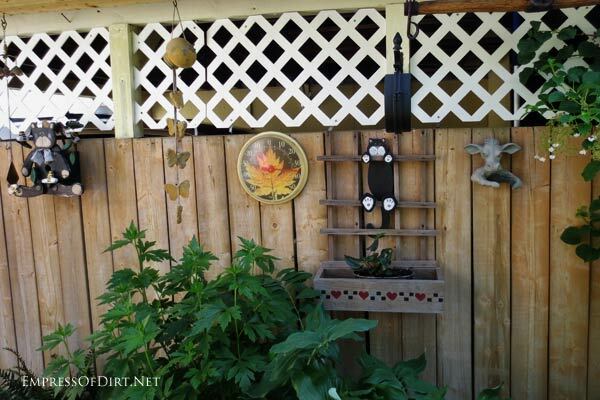 If you are the owner of this garden, please tell me what these cool things on the fence are. I quite like them. 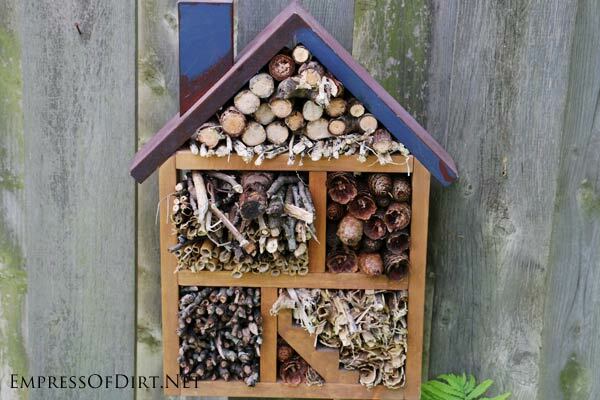 This is my bug hotel. I made it from a thrift shop house-shaped shelf. And here’s the funny thing. There is one chipmunk in our garden who thinks this is his store. I fill the slots with various natural materials, and he comes along and takes them all! It’s happened so many times I’m convinced he must have a mansion filled with twigs and pinecones! 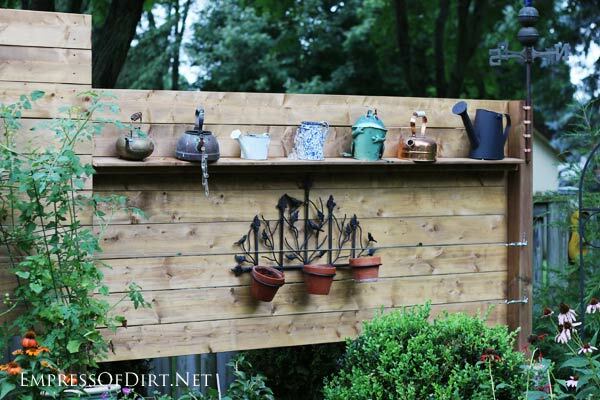 If you love natural materials, you could build some framed shelves, mount them on the fence, and display all sorts of treasures. Until the chipmunk steals them all. 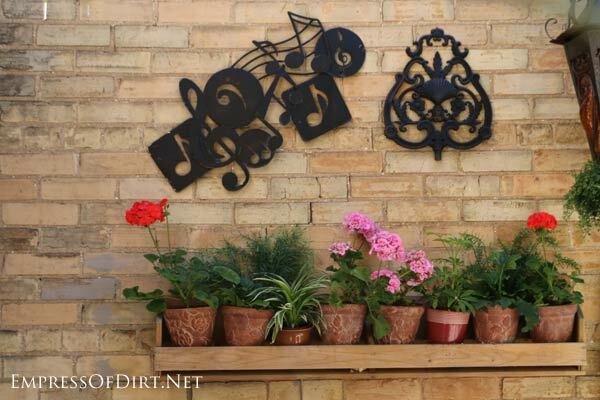 There are a few good ideas here: outdoor wall shelves, lots of clay pots, bright geraniums, and wall-mounted metal art. Use one or all of these ideas at once. I love it that just about anything goes in the garden. Personally, I like to keep indoor decor quite simple, but outside, well, that’s the place to get quirky and creative. And there you go! 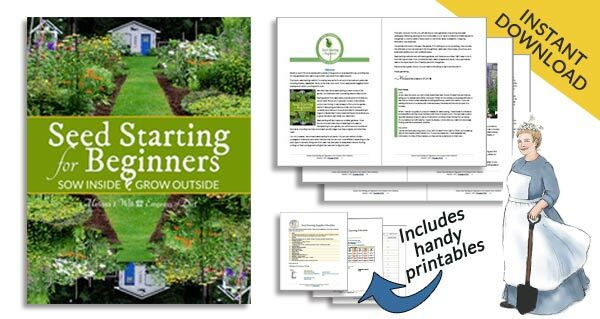 Lots of ideas to use in your garden. Under Random Things: What you think may be carpet tiles look like old metal ceiling tiles to me.